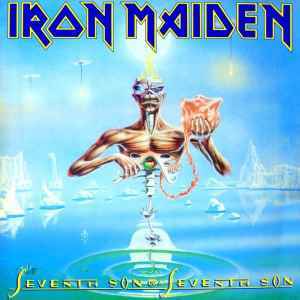 Seventh Son of a Seventh Son is the seventh studio album by English heavy metal band Iron Maiden, released on 11 April 1988 by the EMI label in Europe, and its sister label Capitol in North America. It was re-released on 2002 by Sanctuary/Columbia in the United States. It is the first Iron Maiden release to feature keyboards. Like The Number of the Beast and, later, Fear of the Dark, The Final Frontier and The Book of Souls, it debuted at No. 1 in the UK Albums Chart. It also marks the first appearance of many progressive rock elements which would be used frequently in later albums, seen in the length and odd time signatures of the title track "Seventh Son of a Seventh Son", and by the fact that it is a concept album. Originally released on April 11, 1988, this grouping assembles all variations of the "Seventh Son of a Seventh Son" album as well as its re-releases and subsequent remastered versions (some contain bonus tracks). As much as I'd love to resolve the debate over these pressings, I had a specific need that led me to this purchase - to find any pressing that doesn't skip or have some sort of issue with the opening track. For that purpose, this record rocks. The dynamic range sounds awesome, albeit with a degree of surface noise - but I like a record with character. No regrets. Sounds compressed, looking at the runouts i noticed a lot of unused space. The result is a very silent release, but i'm glad there's not much background noise. Use a sensitive pickup like the Ortofon 2M black. I give a chance on this version because is one of my favorites albums and is very cheap.. My feelings about the quality is somewhere in the middle.. If you compare it with the ugly remastered CD 1998, this version sound a different album.. The sound is more on the original side.. The bass is softer here and not distract you like the 1998.. But if you compare it with the original LP, this version is very very weak.. The original is miles ahead.. It seems here the remastered version kill any explosion of the album and the true atmosphere like always.. The original can fill your roam with music.. Can cover you for fun.. You feel you are inside the music.. But here this version seems weak.. The sound struggle to come out.. Not have the power and the explosion like the original. And that is the truth.. If you want to listen the real album and the realistic music must find the original somewhere. The difference are massive. But if you cant do that, this version is a second good choice.. Better have this than the 1998 remastered.. Absolutely fabulous version of the album. The center labels are beautiful and the sound quality is superb. My only qualm is no double lp of the vinyl. Pretty lame, when some other Maiden releases, did get that in a repress *cough*Fear of the Dark*cough*. This edition is also Remastered, as are all of the EMI Canada Maiden Releases 1980-1992. Sadly the cover print is lousy on this edition - that year started the downhill era of Greek EMI - instead of receiving films from the mother company for printing, they started to photograph the covers of foreign editions to produce the covers - due to this, the albums are looking like bootlegs. The best album is not only of Iron Maiden, but also probably one of the best albums in the genre of heavy metal. This is a perfect album: Maiden's original twin guitar solos, Dickinson's stunning vocal at the peak of his abilities, a huge number of hit tunes and the highest level of recording. All the songs from "Moonchild" to "Only The Good Die Young" - 100% hits, such masterpieces can be done only once, even by the greatest masters, so there is no sense in waiting for the another one "Seventh Son of a Seventh Son" from Iron Maiden.